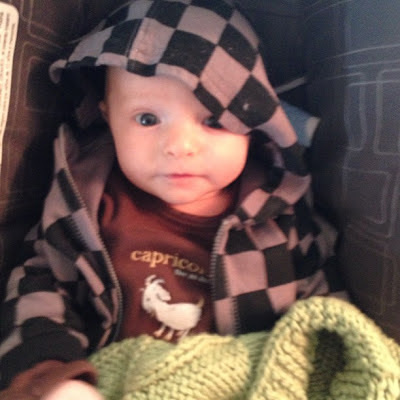 At the ripe old age of two months, the Muffin Man is already a hipster. I haven't put him in a baby fedora (and I have no plans to), but he is wearing vintage baby duds. "Vintage" in this case means used, but let's not quibble over semantics. The main reason for this hipster baby wardrobe is because baby clothes are expensive and I happen to not have a trust fund, and also because the Muffin Man grows out of clothes on a pretty much daily basis. If I had to go and buy new stuff for him all the time we would be living in a cardboard box instead of a dumpy duplex in a questionable section of Hollywood. We're also spoiled in that the kids consignment store in our 'hood happens to be amazing. If you haven't been to Bluebird get yourself over there, stat! Designer kiddo duds for Goodwill prices without any smelly homeless shoppers. Just don't be alarmed if I fight you over the really good stuff.